Convenient 2 oz. travel size pop-up type plastic bottle. 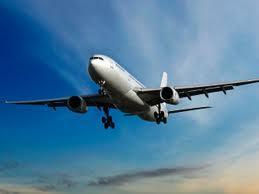 Ideal for air travel regulations. The search for an effective means of dealing with oily hair and skin can be a challenge. Diet, hormones, stress, and health conditions are all factors that can result in an overproduction of sebaceous glands. Sebaceous glands are inside the skin tissue of the scalp, and these glands produce sebum. Sebum is necessary for the health of skin and hair, as it helps keep skin and hair moisturized. 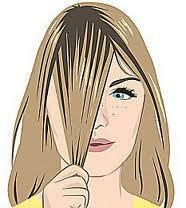 When too much sebum is produced, the hair can absorb sebum oil off the scalp, leading to oily hair. Often this is temporary as when hormones become balanced again, sebum production drops, and problems resolve themselves. Puberty and pregnancy are examples of this. Try to keep your hairbrush and combs clean as these are magnets for a build-up of dirt and oil which gets redistributed every time we brush our hair. The decision to steer away from commercially made shampoos usually stems from scalp sensitivity and/or the growing awareness of the potentially toxic chemicals often added to skin and hair care products. Emulsifiers, preservatives, solvents, and fragrances are all used to achieve the thick, creamy consistency we want and a long shelf life for the commercial market. However, they have their drawbacks and risks of toxicity. Propylene glycol is an inexpensive phytochemical that serves as a solvent and skin conditioner. The concern is that it alters skin structure, allowing the penetration of other chemicals into the bloodstream. Methylparaben is a common synthetic preservative with concerns being possible hormonal changes and its link to certain types of cancer. Sodium Laureth Sulfate is a surfactant which means it helps emulsify and blend different liquids. It can cause problems with skin irritation and again is a substance which alters skin structure. Phthalates are fragrances which can effect the immune system, respiratory and endocrine function. Shampoos advertised as leaving your hair squeaky clean do so but eventually may strip away protective oils and dry out the hair. Problems such as overproduction of sebum and dandruff are often a part of the cycle of washing the hair on a daily basis, which may not always be necessary. Soaps and detergents are not the same thing. 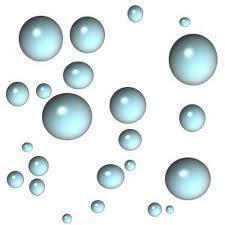 Both are what are called surfactants, which means a washing compound that mixes grease and water. The purpose is to act as a solvent in removing oil and grime. Soap is made with fats originating from either animals or vegetable sources. This fat is combined with an alkali to create what is called saponification. All soaps are made with some form of alkali (Potassium Hydroxide). Soaps are made of natural materials and have less environmental impact. Even though some of the ingredients in detergents may be natural, basically detergents are synthetic. We also have to take into consideration what gets washed down the drains into our water supply and the bio-accumulative effects on our wildlife. Our choice as the base for our shampoo is Dr. Bronner's liquid castile soap. This is an olive oil based soap made without additional chemicals, coloring agents, preservatives, and artificial scents. Water, Organic Coconut Oil*, Potassium Hydroxide**, Organic Olive Oil*, Organic Hemp Oil, Organic Jojoba Oil, Citric Acid, Vit. E.
This Gentle Oily Hair Shampoo will help restore a healthy pH of between 4.0 and 6.0 as well as leave your hair clean, soft and conditioned. Whereas normally much of the glycerin is removed from soaps and sold as moisturizers, the glycerin remains in castile soap. Jojoba oil isn't really an oil, but rather a liquid wax ester that resembles human sebum, excellent for hair and skin care. Aloe vera gel is extremely soothing and healing for the scalp. 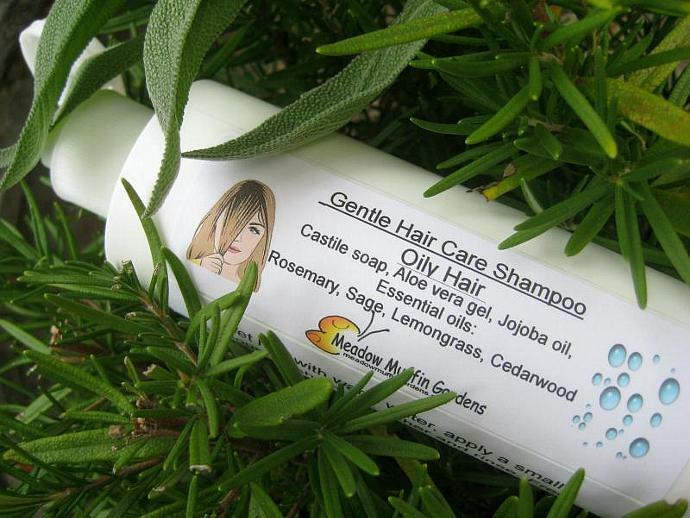 The essential oil blend used for this shampoo is a refreshing and stimulating combination of Rosemary, Sage, Lemongrass and Cedarwood. These plants contain antiseptic and astringent properties that are helpful in balancing oil production and very therapeutic for irritating skin conditions. Lemongrass contains citral which makes it an effective antiseptic, stimulates lymph drainage, and helps with oil production. However, some people may have a contact allergy to citral and citrus oils. Test on a small area the first time you use this shampoo. This shampoo will not result in a billowing sudsy foam being it lacks detergents, nor does it have the thick, pouring consistency of commercial shampoos. However, the high coconut oil content does make for a rich lather and it is concentrated so you don't need very much at a time. Also makes a great deodorizing shampoo for your dog as well. Useful as a gentle circulation-stimulating effect beneficial for the health of your dog's skin and coat. If you have hard water you may find that the castile doesn't rinse cleanly and your hair may feel tangly or gunky. If a water softener isn't an option you can try a water filter for the shower. Should the shampoo be exposed to temperatures dropping to about 50 degrees F, you will notice a cloudy appearance. Put the soap in a warm room, or warm water, and it will clear up at round 70 degrees F. Clear or cloudy, the soap is fine. Avoid contact with the eyes as it may irritate.